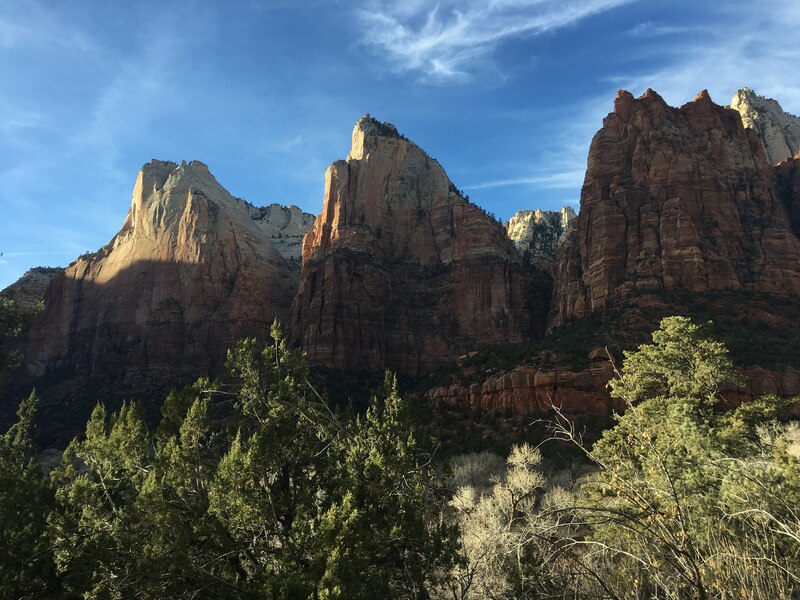 Our Last Day at Zion – Let's Go RVing! We packed in a full day today beginning with a visit to the Visitor’s Center to get some additional instructions about Kolob Canyon (and some information on a nearby grocery store). That done we headed out for our hour ride. The view had not gotten old and we thoroughly enjoyed being surrounded by such majestic beauty. We chose to go to Bryce Canyon yesterday partly because we thought we’d be able to get some groceries. Little did we know that there was no close grocery stores and we would have been better off to go to Kolob Canyon as there was a grocery store in La Verkin which was on the way to Kolob. We rode all the way up to Kolob again admiring the diverse views and colors plus we saw some ostrich along the way. When we got to the Interstate Jerry pointed to the speed limit sign – 80 mph. Wow, that’s pretty fast. We noted the grocery store on the way and knew we’d be returning soon. 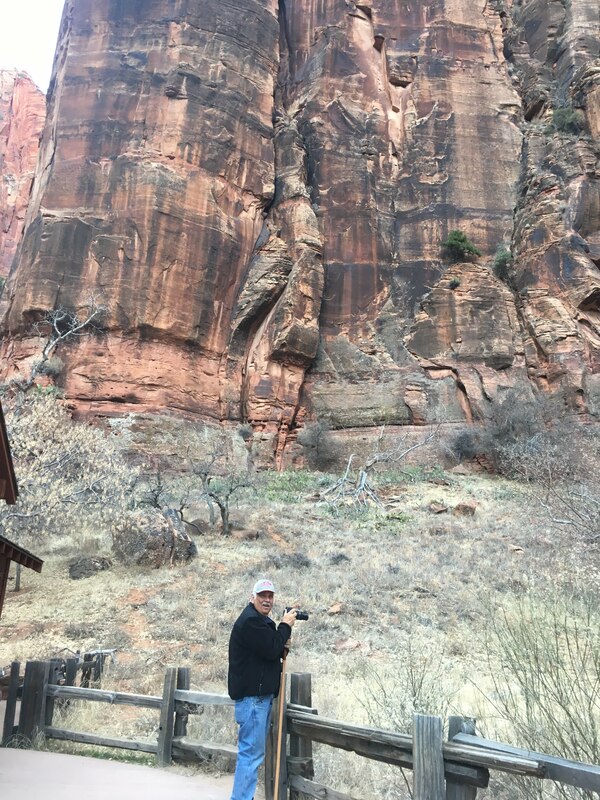 There was a Visitor’s Center at Kolob Canyons and the ranger quickly told us about the three trails, one 15 miles long, one 5 miles long and one 1 mile long. Which one do you think we chose? At the end of the five mile in and out red road (yes, the road was red) we stopped at an overlook where there was a view of Kolob Canyons above the finger canyons. We could see Horse Ranch Mountain with an elevation of 8726, Paria Point with an elevation of 7817, Beatty Point with an elevation of 7520, Nagunet Mesa with an elevation of 7785 and Timber Top Mountain with an elevation of 8055 and right beside that was a butte. It was a clear sunny day so all canyons were easily distinguishable. At the other side of the overlook was the trailhead for Timber Creek Overlook Trail, a trail that passes through a high plateau habitat with animals (yeah, we didn’t see any) and diverse plants. What we did see was a lot of either ice or mud, squishy mud so it was a bit hazardous. At the top we were rewarded with another view of the canyons plus a view of the North Rim of the Grand Canyon. It really was pretty and worth the moderate rated hike. On the way down we stopped at a picnic area and had our picnic lunch. It was a balmy 41 degrees so we could eat outside although with the breeze it was a little cool. We didn’t linger. We returned to La Verkin to the grocery store and were only able to get about half of what we needed so we located a Walmart 7 miles away in Hurricane and headed there. Our ride back to Zion was just as beautiful and then we hit Springdale where there was still road construction and traffic congestion. One way in and the same way out leads to slow moving. We took the groceries to the coach and then returned for our last visit to the Visitor’s Center. We were shopping for the four older grands and found some cute jackets for them. Surely do hope they fit. 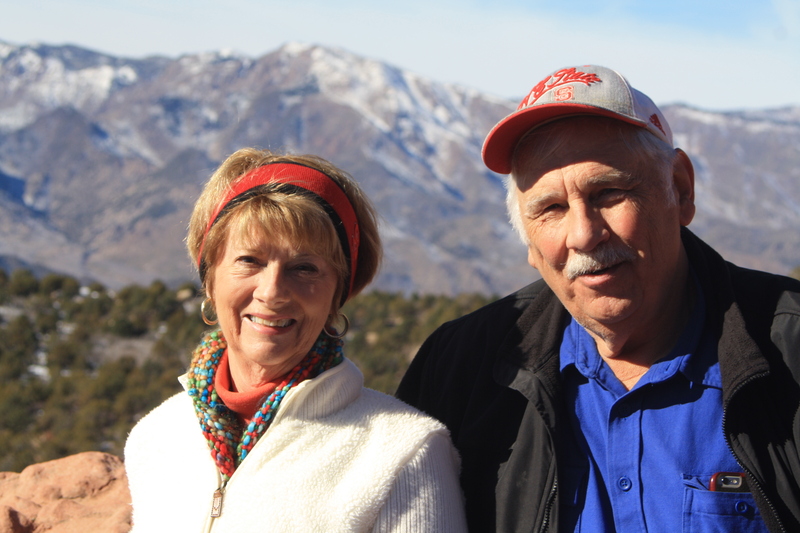 We then started our final ride on the scenic drive to take all the pictures Jerry wanted to take. We stopped several times and he got some stunning shots. One of the places we stopped was at the Court of Patriarchs. Since it was only a 50 yard hike I suggested that we take it. Oh, did I mention that it was all uphill but it was on pavement and was not muddy. The three towering figures facing us were named for the towering figures of the Old Testament: Abraham Peak, Isaac Peak and Jacob Peak and were named by a Methodist minister in 1916. Wow, what a view. Our next stop was the Weeping Rock Trailhead, a short ½ mile round trip where we could see hanging gardens and natural springs. It too was all uphill on pavement and it was steep. In fact, we thought the trail was closed due to ice but there were a good number of people there so we soldiered on. It was beautiful and the view was astounding. The sun was just before setting and was peeking between two peaks. I tried to get a picture of Jerry with the sunlight in the background but the photo appeared foggy, don’t know why. He tried to get one of me in the same way and his too was foggy. We meandered on down to the Sinawava Formation. Here the canyon narrows abruptly. The beginning hike is the River Walk which we really wanted to do but ran out of time. That trail leads on to the Narrows which we knew was out of our league. As we snapped pictures I suddenly realized that Jerry was taking pictures of a doe and a baby. The deer are very prolific here although they don’t look very healthy. They are pretty used to people so have no fear which makes them more aggressive and dangerous to people. We returned to the coach very tired but very thankful to have visited Zion. Jerry and I often talk about places we would like to return to and some time ago decided that because there is so much to see in our beautiful country there is nowhere we’d like to return. Well, that has changed because both of us would love to return to Zion. Although we’ve spent 2 ½ days here I feel that we have barely scratched the surface. It is so clean, so fresh, so refreshing, just a grand place to be. Now, in the summer when the crowds are here maybe we’d feel differently but Zion in January will be hard to beat.